Great post !!! 😀 Thanks a lot. This is a brilliant app – just wish it would come up earlier in the search results! Use this for my customers when they have had their phones setup incorrectly in the past and it sorts everything out. worked like a charm! iphone not so smart without these apps after all. Very good program. It really works and no account needed. AFTER DAYS SPENT TO FIND SOME APP THIS IS REEEEEEALLLYYYY GREAT !!!!! FREE AND WORKING 10000000% !!! THANKS !!!!!! This one was the third one to try and abolutely the best one (and the only one that works)! Thanks for a good hint. Looks like it’s no longer free. It’s $0.99 now..
Yep, 69p here in the UK now. I’ve had nearly 30,000 views for this blog post! Where can I find OrbiConact? I tried via AppStore, but didn’t find it. Found it!! Searched for Orbi-tools and got it!! This is not available in the Australian appstore. 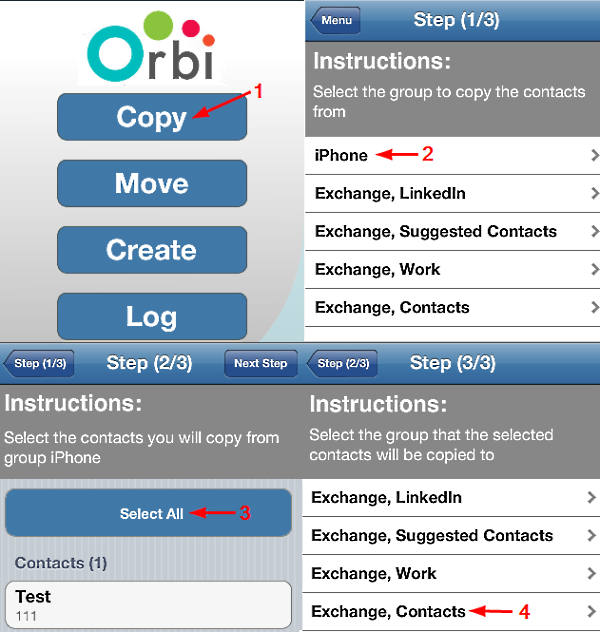 I used OrbiTools using “Move” option. It moved all contact names but not the rest. In the end it erased 1200 contacts and lost all information except for the name. The iphone did not have a backup so now I just made everything worth. moved the contact but deleted all the numbers from the contacts it moved, totally useless. Like a couple of recent users who have given feedback, I used the ‘Move’ option to move contacts from my iPhone to Exchange. It only moved the names – WITHOUT the contact numbers. Looked under the Log option on the main menu, and that was blank. So no trace of the contact numbers. Had about 180 contacts on the iPhone and the move just made them disappear… Really not done. And I paid for this app too! I used this recently and copied the contacts (as screenshots in the post recommended) without any issues. I haven’t come across the issue with the numbers disappearing, but looks like it only occurs when moving vs copying. Copying would always be my preferred option when dealing with this type of data, you can always go back after and remove the local contacts. Clearly there is an issue with the move function of the application, so I would recommend people use copy or look for an alternative application. Will edit the main post, thanks for the heads up!